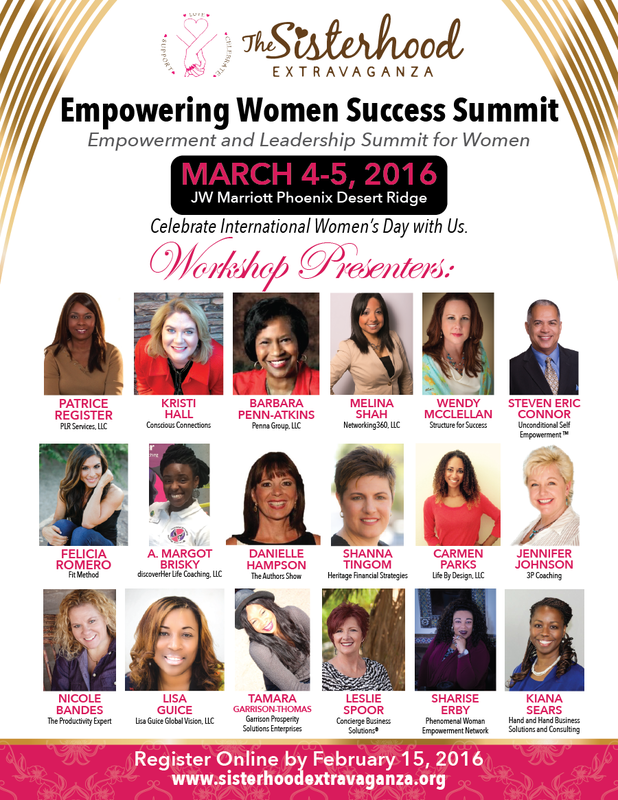 The Sisterhood Extravaganza is hosting it’s 2nd Annual Empowering Women Success Summit in Celebration of International Women’s Day being held on March 4-5, 2016 at the JW Marriott – Desert Ridge, 5350 E. Marriott Drive, Phoenix, AZ 85054. 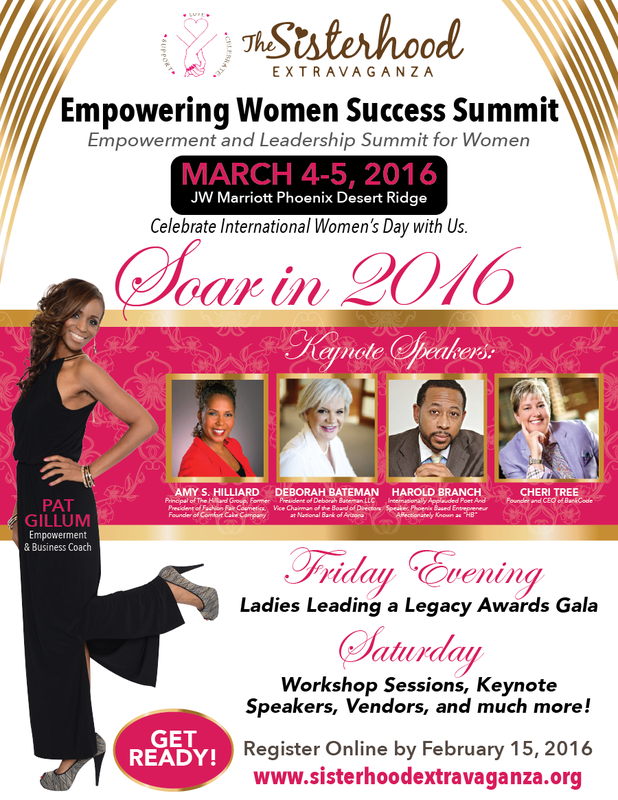 This years’ Summit is aimed at emerging women leaders, corporate professionals, entrepreneurs, and business owners. Attendees will come together for two full days of networking, professional development and personal growth opportunities. Friday evening’s black tie gala/dinner will honor the “Ladies Leading a Legacy Award” recipient’s and Saturday’s agenda will feature a number of high profile keynote speakers and workshop presenters who will share their experience and expertise on a range of topics including personal growth, leadership, career advancement, financial freedom, health and wellness, small business and entrepreneurialship along with a panel discussion session. Research shows that a lack of knowledge and networking opportunities are two of the biggest barriers to women progressing in most industries and that's why events like our Summit is so important. The Sisterhood Extravaganza is a nonprofit organization dedicated to educating and empowering women and girls. We offer a unique experience where we are utilizing the collective knowledge of our network to break down barriers and creating opportunities for women in all industries, vocations and professions to excel and exceed. This is a brilliant opportunity for progressive women to meet people, make new contacts, hear first-hand advice from industry experts, and boost their skills and confidence to soar in their personal and professional lives. For more information or to register for the Sisterhood Extravaganza Empowering Women Success Summit please visit the website www.sisterhoodextravaganza.org or contact Pat Gillum at 623-455-2117.